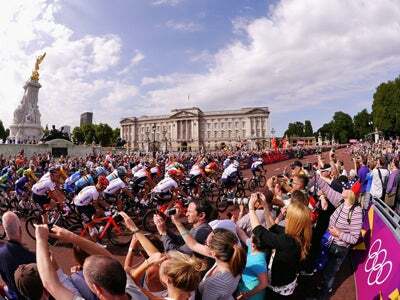 Heading to the London 2012 Olympic Games in the next few days? Check out this guide that reveals the cameras you can and can't take with you. If you’re one of the lucky ones to get a ticket for the London 2012 Olympic Games you’ll be keen to pack your camera. Just before you do you’ll want to familiarise yourself with the current camera restrictions in place. Just last week, Olympic organiser Locog sparked confusion amongst many of those who purchased tickets for football events at Wembley. An advisory, made by Olympic sponsor Panasonic, recommended ticket holders check the conditions of entry to venues after Games bosses warned visitors not to bring any types of interchangeable-lens cameras to the home of football events. One of Locog’s main concerns was that interchangeable lens cameras foul the rules on what is classified as a professional-looking camera, thus ruling out the use of DSLR’s, including mirrorless, compact interchangeable lens cameras manufactured by Panasonic, Sony, Fujifilm, Pentax, Olympus and Nikon. So if you’re advised not to take an interchangeable lens camera to Wembley, what can and can’t you take in to other London 2012 Olympic events? Well, there’s nothing to say you can’t take an entry-level, enthusiast or pro-spec D-SLR to the London 2012 Games, however you will need to bear in mind it has to adequately fit in a bag that’s no larger than 30x20x20cm. To get around the issue of camera size many visitors turned to the idea of separating the lens from the body and packing the items individually with appropriate body/lens caps attached. Provided the lens you take doesn’t exceed 30cm in length you shouldn’t have any difficulties, just remember tripod’s aren’t allowed so you’ll want to make good use of any image stabilisation feature your system has. As for the offical Olympic rules, large photographic and broadcast equipment rules apply. Refering to Section 19.2.3 of the London 2012 Olympic terms and conditions it states any large photographic or broadcast equipment over 30cm in length (including tripod and monopods) will be restricted. Should you run the risk of trying to enter the Games with such equipment you’ll be refused on entry and won’t be granted permission to your seat. 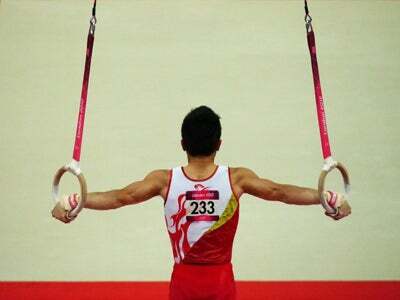 Sports photographer Dean Mouhtaropoulos took this image at the mens gymnastics on day three of the Olympic Games. Adding to this, section 19.6.3 states that: “Images, video and sound recordings of the Games taken by a ticket holder cannot be used for any purpose other than for private and domestic purposes and a ticket holder may not license, broadcast or publish video and/or sound recordings, including on social networking websites and the internet more generally”. For more information on the prohibited items at the London 2012 Olympic Games click here.